McFarland center Kathy Rodriguez fouls on a putback attempt. McFarland's Kathy Rodriguez, center, is double-teamed by Oakland's Khirah McCoy, left, and Mae Alexander, right, during the second half of Friday's CIF girls' Division III state high school basketball championship game in Sacramento. McFarland's Kathy Rodriguez (32) looks to take a rebound. McFarland High School center Kathy Rodriguez goes for a putback attempt against Kennedy. McFarland High's Kathy Rodriguez runs into the defensive effort of Stockdale High's Naomi Jennings, left, and Maby Lomotos in the championship game of the Arvin Holiday Showcase girls basketball tournament Friday night. 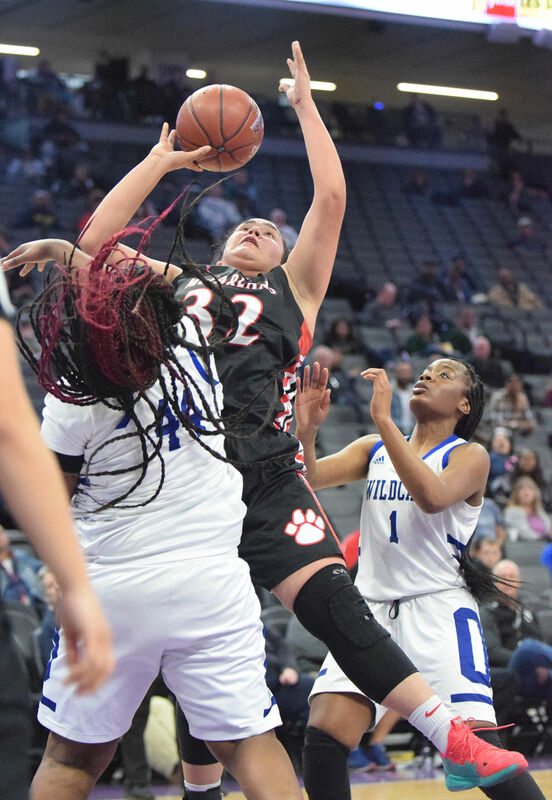 A CIF State Championship appearance by a team from Kern County is rare — the Cougars broke a 29-year girls basketball drought for the county when they advanced to the Division III title game in March. A legendary season came to an end in a loss to Oakland, but the season will be remembered as the best in school history and one of the more remarkable runs for a local girls basketball team in decades. In front of it all was senior post player Kathy Rodriguez, and her strengths mirrored that of the team throughout the year. Rodriguez, like McFarland, went from an inspirational start to the season to completely dominating in the Southern California Regional playoffs. Because of her performance and the Cougars' memorable run, Rodriguez is the 2018-19 BVarsity All-Area Girls Basketball Player of the Year. The Cougars (31-6) began the season 15-1 with the lone loss during that stretch coming against Caruthers — the eventual D-V state champion. McFarland cruised through its first year in the South Sequoia League with ease and Rodriguez was on the court each night posting double-doubles like clockwork. On the season she averaged 13.8 points and 14.2 rebounds per game. In the Central Section Division IV semifinals, McFarland took a big step towards something special with a 68-61 win over Hanford-Sierra Pacific, the defending D-V state champs. Rodriguez scored 10 points and grabbed 16 rebounds in the victory. The Cougars fell four days later, however, 50-38 to Fresno-San Joaquin Memorial in the D-IV section finals. Like McFarland, Sierra Pacific lost in the D-IV finals the previous year. The Bears were then seeded No. 1 in the D-V state playoffs and eventually won the tournament. Similarly, McFarland was seeded No. 1 in the 2019 SoCal D-III state postseason bracket and it sent a shockwave through the team. “My reaction was, ‘man, we’re going to lose at home as the 1-seed,'” Samaniego quipped. But the Cougars didn’t lose at home and Rodriguez was key to the winning success. In four SoCal regional playoff games — all at home in front of overflow crowds each night — the senior was incredible. She averaged 22 points and 18 rebounds per contest, as the Cougars became just the third team in Kern County girls basketball history to play for a state title, and the first since Rosamond in 1990. In the first three rounds of the state playoffs, Rodriguez was nearly unstoppable. Each of those three games she scored at least 19 points and pulled down at least 19 rebounds. She scored 21 points and grabbed 20 rebounds in the second round win over Sun Valley-Village Christian.